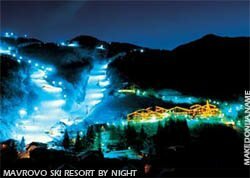 The Mavrovo ski-resort "Zare Lazarevski" is located on the slopes of Bistra mountain, in one of the most beautiful parts of the country, Mavrovo. The resort is always mentioned as Mavrovo ski resort. Mavrovo ski-resort is a part of the National Park of Mavrovo and it's situated 41 km from Gostivar, while from the capital of Macedonia, Skopje is 106 km away. 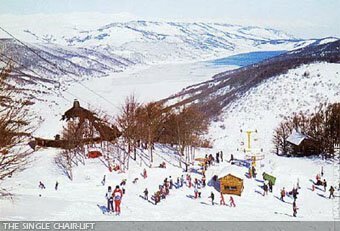 The Mavrovo ski-lifts and chairlifts were began to be built in 1964, by the ideas of Zare Lazarevski, who planed to built ski-lifts and chairlifts all across the Mavrovo lake and the built the largest ski-resort, then not only in Yugoslavia, but the entire Balkan Peninsula. As you approach to the Mavrovo ski-resort, the first you will see are the chairlifts, one single and two double 500 meters from the old Mavrovo church, Saint Nikola. The single chairlift starts at 1,247 meters, the first stop is at around 1,400 meters, while it ends at 1,605 meters by the crveniot (the red) ski-lift and the small hut. The old double chairlift starts at 1,255 meters, his first stop is at 1,603 meters, by the plaviot (the blue) ski-lift, while it ends at 1,680 meters between the big hut and žoltiot (the yellow) ski-lift. The new double chairlift starts at 1,257 meters, his first stop is at 1,630 meters and ends at 1,690 meters. It is parallel with the old double chairlift. The 11 ski-lifts are situated among the entire slopes. The most known are: Plaviot (the blue), Crveniot (the red), Žoltiot (the yellow), Detskiot (for kids), Galički, Belički and 5 other, of which 3 are in the place known as the hole (dupkata), 1 by the Plaviot ski-lift and the last one is Galički 2, parallel to the Galički ski-lift. Belički is the highest ski-lift of all, that ends on 1,860 meters above the sea level, just 300 meters under the highest peak Medenica 2,160 meters. The bottom of the ski slopes at Bistra, are located near the artificial Mavrovo lake. Three chairlifts start their trip from here, up to the ski slopes, with a capacity of more than 1,500 persons per one hour. The ski centre possesses 11 ski-lifts (drag-lifts) synchronically connected, with the capacity of over 5,000 skiers per hour. The ski slopes at Bistra start at 1,247 m and end at 1,860 m high. The most beautiful ski runs for downhill, slalom and super-slalom are located in this area. The famous "Bačilo" is a cafe which offers the visitors various hot and cold drinks and snacks, in exclusively pleasant surroundings. 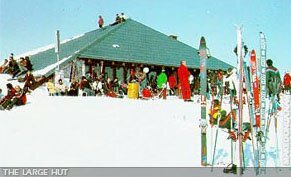 Traditionally, on the ski slopes of Bistra, for several years now, the international ski competition "Mavrovski Memorial" is held, at the beggining of March. The entire Mavrovo area represents, both summer and winter recreational resort, together with the villages: Mavrovo, Mavrovi Anovi, Leunovo and Nikiforovo, that today represent a weekend settlement. There are about 1,500 cottages and weekend houses. The complex Bunec, near the village Duf, is the host of the "Snow city" event which is held every year during the winter period, with thousands of children competing in making snow figures. "The Mavrovo hotels: Radika and Bistra"
The Mavrovo area is extremely rich in diverse flora and fauna. In Mavrovo region, there are many hunting grounds for does, bears and specially lynxes - which live only in this region. Mavrovo Lake particularly enhances the beauty of the region, with its pure and clear water, and abundance of trout, providing the opportunity for sport fishing. The stay of tourists is enriched with the numerous natural features, cultural-historical monuments, striking scenery and mountain villages. Near Mavrovo, is the Monastery St. Jovan Bigorski - an interesting place with impressive historical and artistic value. The road to the monastery leads through the impressive gorge of the river Radika. Only a few kilometers from Mavrovo, there are the villages Galičnik, Lazaropole, Gari, Tresonče, Rostuše. These are small mountain villages with original architecture, interesting traditional customs and folklore. In the summer period, the slopes of Bistra offer ideal conditions for mountaineering and short walks. The spacious green areas, the flower meadows, the abundance of diverse forest fruits, as well as the numerous mountain pastures create unique landscapes of untouched natural beauty. In June, the famous "Mavrovo Assembly" is held with the participation of numerous ensembles, folklore and revue groups. In the immediate vicinity of the lake, at a height of 1,230 meters, is the village Mavrovi Anovi. Located in the pine woods, the "suburb" harmoniously fits in with the mountain scenery and the old houses are especially attractive on account of their distinctive architecture. Along the lake shore, there are modern weekend-houses and numerous restaurants. The old Mavrovo Anovi village have always had a rich tradition of being a place for the overnight stay of travelers and people in search of work abroad, from this region. With the construction of the lake, most of the old houses vanished in the depths of Mavrovo lake waters.